I've never watched an entire episode of the classic George Reeves Superman. Growing up a 70s/80s kid, Christopher Reeve was (and is) my Superman. But I am tempted to dip my toe into these. To those familiar with the show, do you think a Chris Reeve fan would be able to enjoy them, or would they feel just before my time? I do of course enjoy Batman 66, but that's a completely different show. From what I see, I'm a bit turned off by a lack of fanciful villains. Would anyone like to convince or encourage me? Or mentally prepare me? I say go for it Andy! I own most of the seasons....missing one I think, and I really enjoy them. I prefer the color seasons just because it's Superman and I love seeing that costume in all it's glory, but I admit the stories are better in the earlier B/W episodes. You actually get to see a LOT more of Superman being super in the show. He's constantly smashing through brick walls, using his x-ray vision, etc. It's really cool. I think you'll love it. I have the whole series on dvd. I just cherry-pick. The cast is engaging. Season one is more adult and gritty (cf. Lost in Space). Reeves is just fine as Superman, his performance doesn't infringe in any way on my affection for Reeve. He's more avuncular, and his Kent more capable. The episodes do feel dated, and under-budgeted at times. But I can can push past that and enjoy myself--after all, the Reeves films have some dated elements as well. If I have one complaint about the show, it's that it's rather pedestrian in the way that the Wonder Woman series is in later seasons. I like good villains, and Batman '66 delivers those in a way that Superman and WW on TV do not. So I find the Superboy series a little more fun than Superman. But there's a lot more of Superman and Batman in their shows than WW (seasons 2-3). I suggest you try season one and go from there. It's just my opinion, but I hope it helps. They are half hour episodes, correct? Do they have cliffhangers connecting them, or are they self contained? Something to mull In my mind (and I think T-bold has said this before), the Superman TV series is the golden-age Superman, and Reeves' movies are silver/bronze-age. For me, they don't conflict. Also, if you're a Noell Neill fan, she's not Lois until season two. Last edited by PNGwynne; Dec 30, '18 at 2:01 PM. yeah start at season one. George Reeves was my Superman growing up, and he really did something with the dual role. ^ Interesting. Could be the color ones are more for me. It may be awhile though. 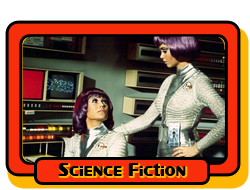 Thanks to Plaid Stallions, I've got the complete series of UFO and Star Maidens to binge on. It may be awhile though. Thanks to Plaid Stallions, I've got the complete series of UFO and Star Maidens to binge on. Oh that Brian, he's always proselytizing UFO lol--but he got me hooked on it, too! Great show. The great thing is that they do not need to be watched in order. The only one that has chronological relevance is episode 1 season 1 "Superman on Earth" - It would be a great one to watch first, but is not necessary. The only one that is not half an hour is Superman and the Mole men. It can be viewed as a 2 parter (The Unkown People) totaling 44 mins. of content (1 hour with comercials) - Or better as a feature film that is 61 mins long and served as the pilot for the series. There are some minor inconsistencies with the series. The B&W episodes are generally thought to be higher quality and are sort of Crime Noir. The Color episodes are a little more fun and -well in color. Most episodes are great -but there are some duds. So if you start with a dud, give it a chance. Just watched 5 minutes to doom B&W. It is very good. All that Glitters is the final episode, and I love it! Last edited by Brue; Dec 30, '18 at 6:18 PM.